To ensure that there is a system in place to address any incidence of workplace bullying. Workplace bullying: is the tendency of individuals or groups to use persistent aggressive or unreasonable behavior against a co-worker or subordinate. Workplace bullying can include such tactics as verbal, nonverbal, psychological, physical abuse and humiliation. There are a number of avenues to address bullying in the workplace. If an employee feels that they are being bullied, it may be appropriate for the employee to attempt to resolve the issue by telling the offender that his or her behaviour is unacceptable and that it should be stopped. If the offender is told that the conduct is distressing, it will often result in the bullying ceasing. Recommended that staff document any incidents and action taken. The Chief Executive Officer is the designated Workplace Bullying Officer (WBO) for the organisation. If an employee wishes to invoke the bullying complaints procedure, the employee should contact the WBO who will listen to the complaint and explain the various options that are open to them. The WBO will be assigned to gather facts and to prepare statements (if warranted). If appropriate, the WBO will attempt to act as a mediator to facilitate resolution of the matter between the parties. If an employee does not feel comfortable approaching the WBO, they should contact their Unit Manager/ Team Leader or another employee and have them contact the officer on the complainant’s behalf. Any complaint will be dealt with in strictest confidence. The CEO is the designated Workplace Bullying Officer and has the role of providing advice and support to the complainant. 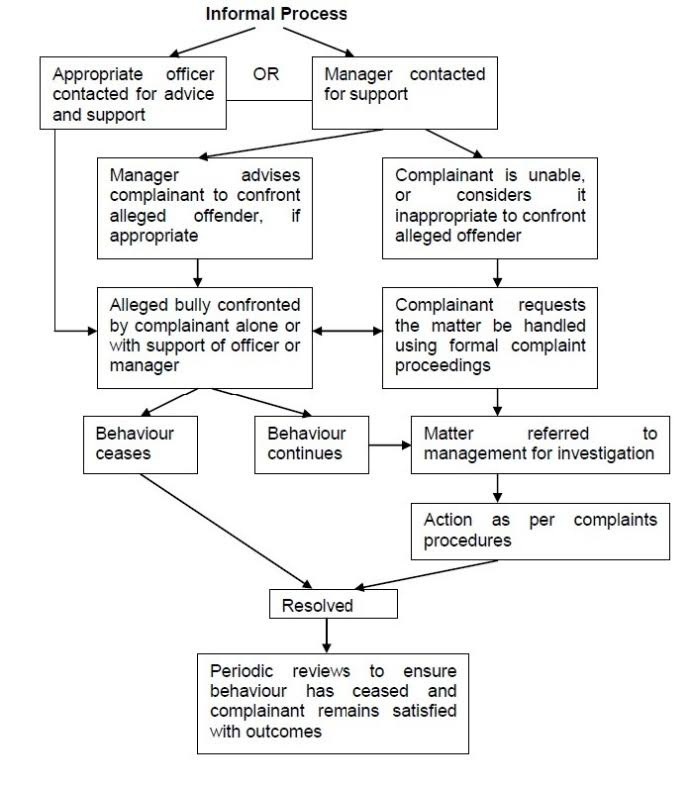 The Workplace Bullying Officer is required to undertake periodic reviews to ensure behaviour has ceased and complainant remains satisfied with outcomes.